Kev loves making these as a quick and healthy treat – it totally satisfies both the ‘sweet’ and ‘salty’ cravings – great for ‘on the go’ snacking too! Scoop the dough by heaping tablespoons, then roll between your hands to form balls. Arrange them on a baking sheet lined with parchment paper, then place in the freezer to set for at least an hour before serving. Store the energy bites in a sealed container in the fridge for up to a week, or in the freezer for an even longer shelf life. 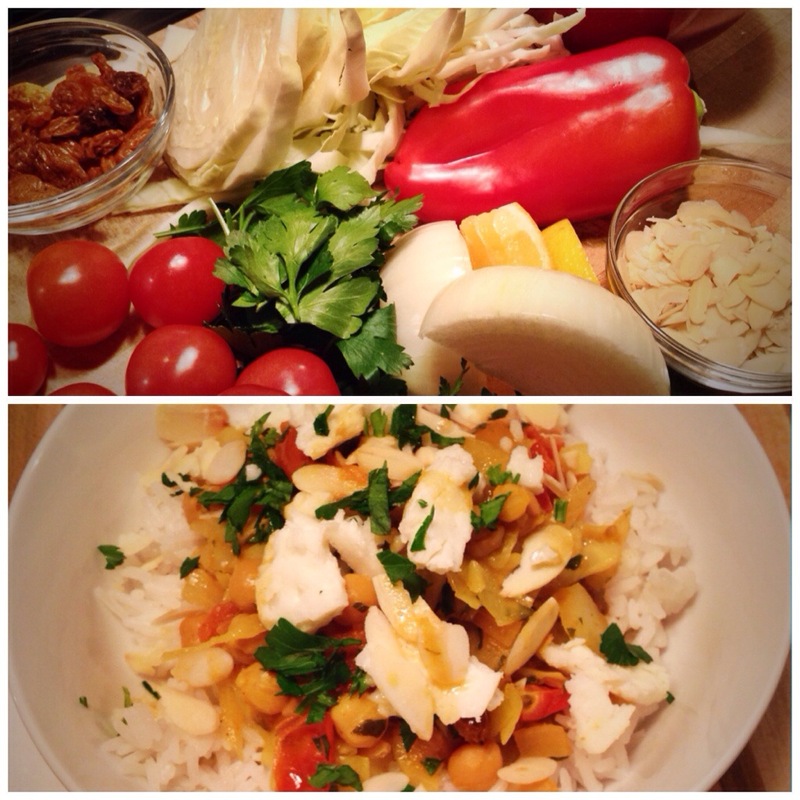 Since Winter is dragging it’s heels, we figured a fresh veggie stew was in order on a cold winter night! Enjoy this vegetarian delight! In a large skillet, heat the olive oil and saute the onions for 5 minutes or until softened. Add in the bell pepper, coriander, turmeric, cinnamon, and cayenne and other spices; stir and saute for 1 minute or so. Add in the tomatoes, veggie stock, chick peas, and currants/raisins; stir to combine and simmer, covered, for 15 minutes or until vegetables are just tender. Serve over rice, bulgur or couscous, finish roasted almonds & with feta cheese. Kev loves to make fresh juices every morning, and also whips up some great smoothie creations as well. 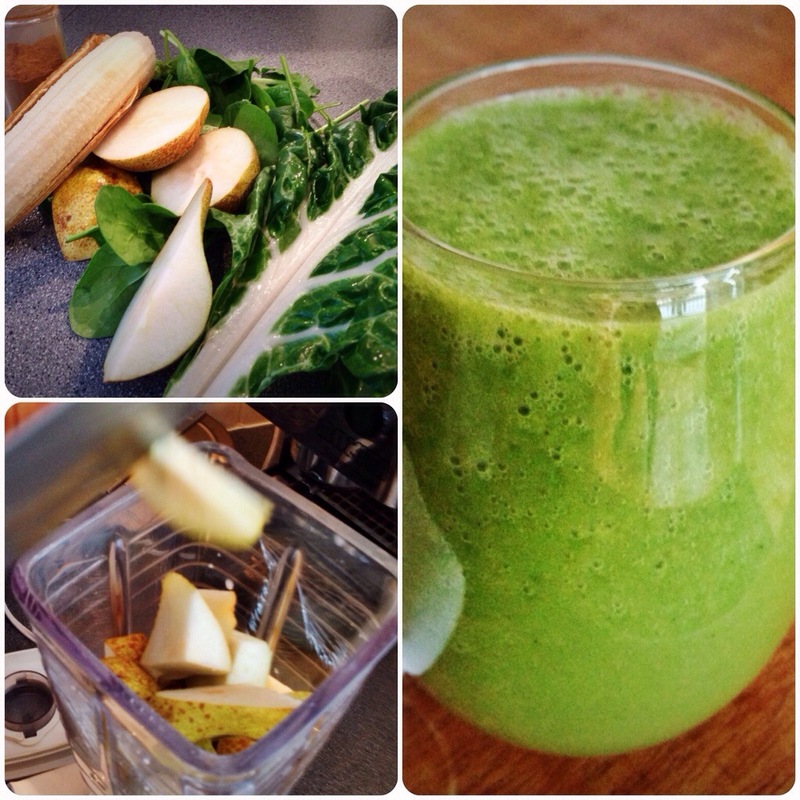 This is one of his latest ‘pre/post’ workout fav’s, which is light & fresh and packed full of vitamins and nutrients! Chop the fruit and put it in a blender with the liquid ingredients. Whizz at ‘liquefy’ for 2 minutes, then add in the spinach, kale and ice cubes and whizz again for a minute or two. Finish with a few dashes of cinnamon and ENJOY! *You can substitute the pear for oranges (peeled of course), and omit the cinnamon if you wish. Also, if you don’t have both spinach and kale, you can simply use one or the other. For those of you who like energy bars, either for training or as a snack on-the-go, this is a homemade, healthy and yummy option! Step 1: Prepare a 10″x10″ baking pan and line with parchment paper, making sure the paper over-hangs the edges. Set aside. Step 2: In a Food processor, using a metal blade (or vita-mix) add almonds and pulse until they are uniformly chopped (like a bread crumb texture), then add the chocolate and pulse again until the chocolate pieces are finely chopped. Place the nuts and chocolate into a bowl and set aside. Step 3: Add half the dates to the food processor or vita-mix and process until a firm paste forms and clumps together, then add half the peanut butter, followed by half the nut/chocolate mix. Pulse a few more times until combined… then scrape into the prepared pan! Step 4: Use a fork, or your hands, to press the mixture firmly and evenly into the bottom of the pan, fold the excess paper over the bar mixture and refrigerate for at least 2 hours. 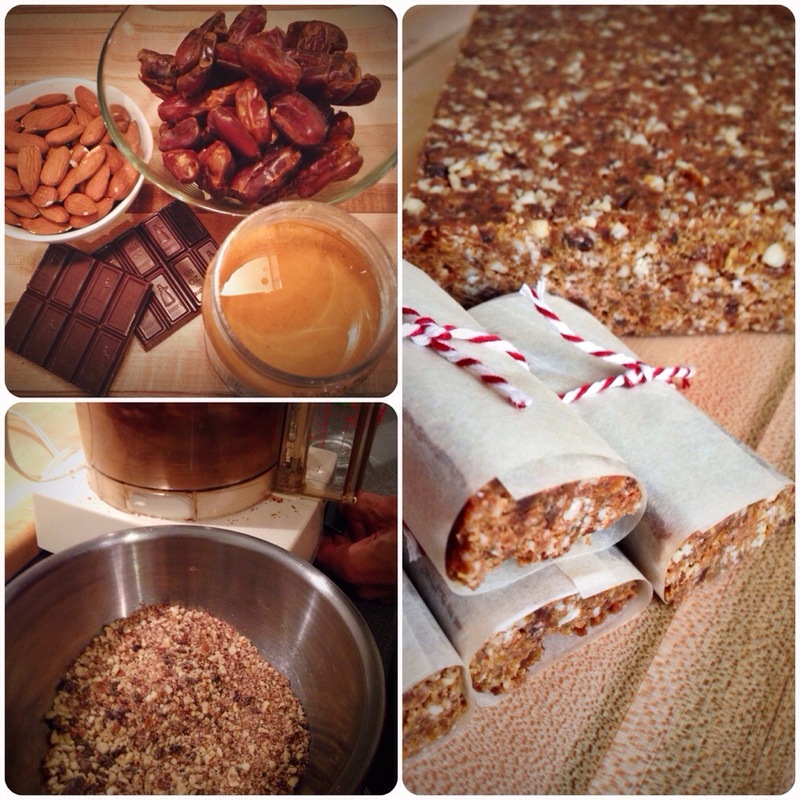 Step 5: Transfer to a cutting board and cut into desired size snack bars. You should get about 15-18 large bars, or 25-30 snack size bars. Store in a tightly covered container and refrigerate until needed. Bars will keep in the fridge for 2 weeks, and an unrefrigerated bar will keep for 48 hours, covered, at room temperature. We discovered the wonder of fresh juice in 2009 while in Mexico racing at Ironman Cozumel. We were staying at the El Presidente Intercontinental, and the head chef at the restaurant would blend up these amazing concoctions for us each morning. He was kind enough to share his recipes with us, which inspired us to experiment on our own when we returned home… we’ve been juicing ever since! It’s quite simple to blend a wide variety of fresh fruits & veggie’s together in a wonderfully-fresh, nutritionally-packed juice. The health benefits have been tremendous for us, providing a daily mega-boost if vitamins and nutrients, aiding in our recovery and giving a boost to our immune systems. No need for additional vitamins or supplements! 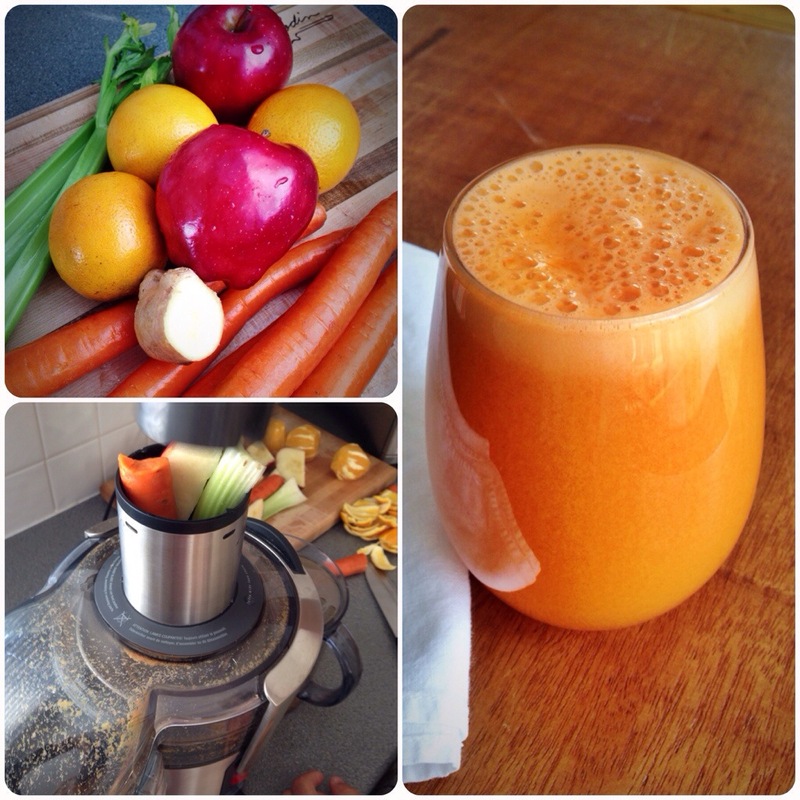 We have a Breville 510XL Multi-Speed juicer, and put it through it’s paces! Simply wash & core your favourite fruits & veggies, removing thick skins from oranges, grapefruits and pineapple – then whizz away!!! We love this soup from fall to spring, especially after a long run! Melt butter in heavy large saucepan over medium heat. Add onions and sauté until very tender and brown, beginning to carmelize – about 45 minutes. Add garlic and sauté for another 2-3 minutes. Add wine and simmer until reduced to glaze, about 3 minutes. Stir in chicken broth, balsamic vinegar and mustard and add a bay leaf. Simmer 20 minutes. Remove bay leaf and season to taste with salt and pepper. Preheat broiler. Ladle onions and broth into ovenproof bowls. Top each with 1-2 slices of toast and mound on emmental and suisse cheeses, then top with parmesan. Broil until cheeses melt and bubble. ENJOY! This one is decadent, but well worth it after a long run! Cook the pasta “al dente” in boiling water. Drain the pasta, return to the pot and coat with the olive oil. Set aside. Over low heat, in a large non-stick pan, melt 2tbsp butter and add the minced garlic. Once the garlic begins to sizzle slightly, add the milk and white wine and heat until warm, and then add salt and pepper to taste. Meanwhile, make a ‘roux’ with the remaining butter (melted) and flour in order to thicken the milk/wine mixture to a nice texture. Add the cheddar and parmesan cheeses and whisk until smooth and creamy. Combine the cheese sauce with pasta until thoroughly mixed, then blend in torn spinach and the lobster pieces. Top with shaved Parmesan cheese and breadcrumbs and garnish with lobster, then broil for a few minutes until breadcrumbs brown and the cheese sauce bubbles!